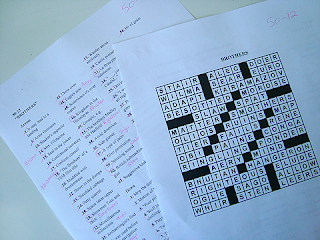 Lots of crosswords in this post! I'm working as a Technical Editor again on a new Wiley book. 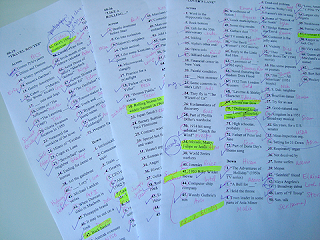 I've got 150 crosswords to edit, which means fact checking all the clues, making suggestions / corrections, assessing their difficulty level, and checking the page proofs. The job will take a couple of months. For each puzzle I print out the clue list and the answer grid, and then read each clue, and check its answer. If the answer is obviously correct or simple, I cross off the clue number. If there's something that has to be fact checked (eg the title of a movie, the date of some event, an actor's name etc) I circle the clue number. I also circle clues which have unusual words as answers, especially since these puzzles are supposed to be easy. 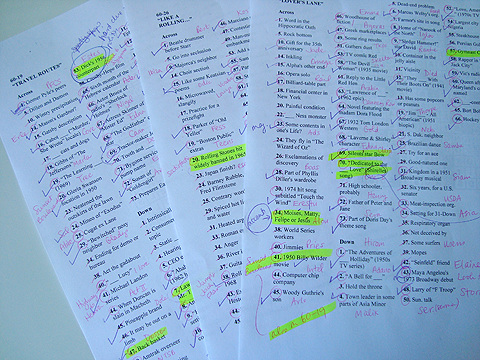 Then I hit the computer - by using my Oxford Dictionary (US version), Google, Wikipedia, IMDb, online encyclopaedias, and many other web sites, I can generally quickly verify each circled clue, or correct them if needs be. I use the clue database on Cruciverb.com too, an invaluable resource when editing American crosswords. The yellow highlighter shows clues that I've made editing notes on. After checking all the clues on one puzzle, I edit the Word document adding my notes and corrections to the clues, and then send it back to the Project Editor at Wiley. Unfortunately, there isn't the time to solve each puzzle from scratch, filling in the grid clue by clue (which would be more fun!). I have to work fast; each puzzle takes around an hour to edit, so it's still a lot of work. I ordered a bunch of Bendigo Luxury 8 ply in Brick, Black and Cream, and made a start on 28 March! 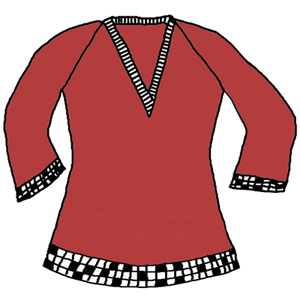 I'm using the rough "design your own" guidelines from Custom Knits to help. In 3 weeks I've got this far (which is a bit of a speed record for me! ), and am so happy with how it's turning out. 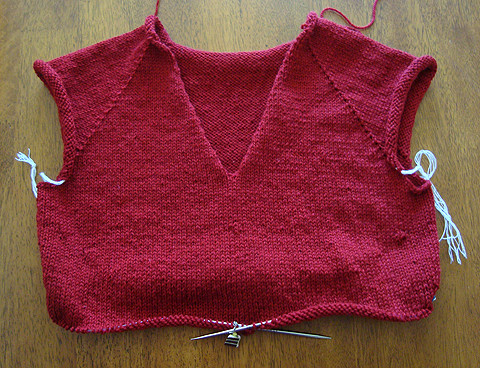 I've added short row shaping in the bust, and waist shaping. The crossword grid is a British style grid of my own design. There was a fair bit of unravelling and trials for the lower edges - the stranded knitting sections were curling up quite badly. The solution was adding hems in black behind each crossword grid section - a few rows of black, 1 row of purl (which creates an easy 'fold line') and then a change to slightly smaller needles. Then I knit however many rows it took to completely cover the back of the stranded knitting section. Then the hem is stitched into place. So they're double fabric in those parts, very stable and warm! 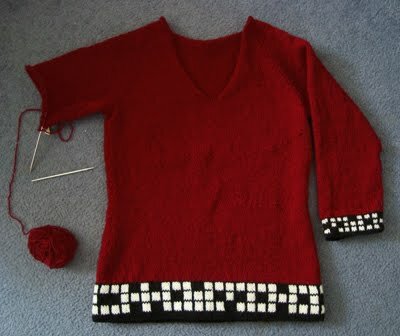 I wasn't sure what to imagine with a crossword jumper - that is going to be stunning! It's gorgeous! I've got a book of UK style crosswords and I think they're much more difficult and esoteric than US ones. A lot of it is cultural but some of it is the structure. UK all the way for me too. And: I Love Your Jumper!!! Is that too cool for school or what? Awesome, awesome jumper! And the colors are so sharp and crisp. Hooray for gainful employment! But it has been a while since you had time and energy to paint, hasn't it? To check a whole puzzle in an hour, you must really put your head down and focus! Wow! That jumper is impressive. Yeah, but those letter beads we were talking about would be so much fun! Wow, that's looking stunning. The black and white really wakes up that red.